The shock of blue is almost difficult to comprehend. Though we had been driving along the Dulong River for hours, every time I looked, the jade-colored waters seemed unreal. It’s half an hour past noon, but the mountain air is crisp. The battered wheels of the sedan grind to a halt. My guide and I have finally arrived at one of the most remote villages of Yunnan Province in Southwest China — a village I’ll call Hongdang to protect the privacy of its residents. It’s taken five days of driving across deep valleys and narrow mountain passes for us to get here from Kunming, the provincial capital. The Dulong River Valley is where the indigenous Drung people have lived for hundreds of years, largely isolated by jagged peaks and dense forests. We are greeted by the sight of peach trees in full bloom, with their delicate pink flowers sprinkled across terraced slopes of Hongdang village. 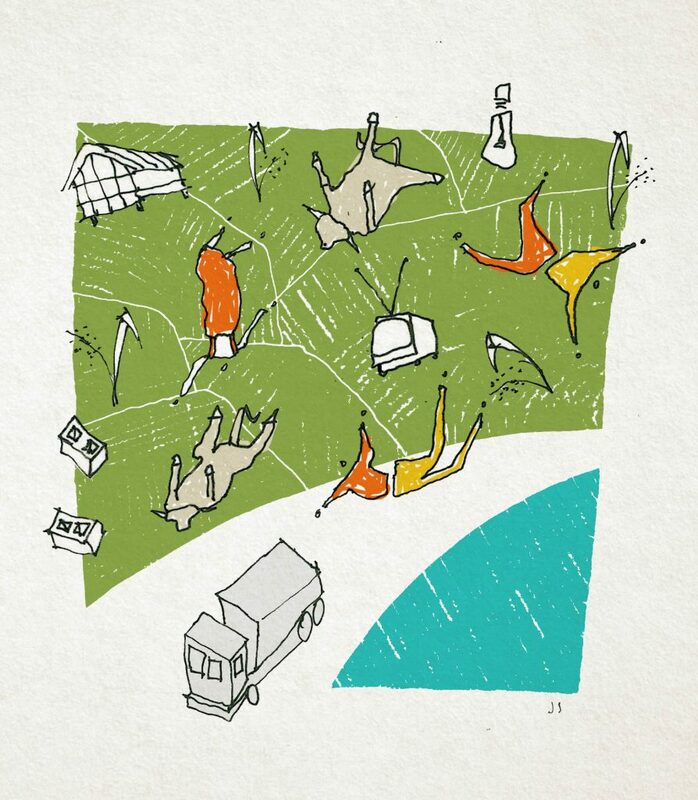 Villagers’ laughter drifts over from the fields where they are working, mingling with the chirps and songs of birds. April is warm enough for farmers to begin tilling the soil, as they have done for generations. Perhaps in an earlier time, a place like this could have been the inspiration for the fabled “peach blossom spring” of Chinese antiquity, a mythical land where food is abundant, and people are safe from political turmoil. Hongdang, a motley assortment of log cabins in the foothills of the Gaoligong Mountains, can attribute its tranquillity to its remoteness. The village is tucked away between Tibet and northern Myanmar in the Dulong River Valley, home to some of the richest biodiversity in China, as well as some of its last remaining old growth forests — a far cry from the giant cities and smog-filled skylines of China’s eastern coast. I’ve come all the way to this corner of Southwest China in 2017 to see what is happening in the headwaters of major rivers in Myanmar, where in 2011, widespread public protests led to the suspension of Chinese-financed dams. With China’s expanding political and economic clout abroad, pundits and academics are all paying more attention to China’s increasingly stringent environmental policies in the government’s modernization drive. This shift in government sentiment towards environmental considerations is encompassed by the aspirational but nebulous “ecological civilization” strategy, which includes banning people from land-based livelihoods in the name of ecosystem conservation. On one hand, modernity and development for the Chinese government mean people leaving the forests and hills for cities, with nature being something to conserve and enjoy, not live in. On the other hand, modernity and development also require economic growth, which has largely been environmentally destructive in China. As a means of harmonizing those competing goals, the government is pushing full steam ahead to create the transportation and energy infrastructure in Yunnan’s rugged mountains to facilitate a growing eco-tourism industry — a silver bullet for a money-impoverished but scenery-rich region. What slips through the cracks are the needs of indigenous people who already live in these beautiful places. I wanted to find out how the Chinese government’s seemingly contradictory promotion of both infrastructure development and biodiversity conservation in the Dulong River Valley has impacted the indigenous Drung people and their unique way of life. For most of its history, the Dulong Valley was blocked off by snow for half the year, rendering it inaccessible to all but the most intrepid explorers. In decades past, Chinese botanists would hire donkey caravans to take a five-day trek from the nearest town, crossing precarious slopes to reach this land in search of forest treasures. Only in 2014 did the Chinese government make moves to open up this isolated valley to the rest of the world year-round, with the construction of a 7-km long tunnel through the mountain range, bypassing the old mountain footpaths. Travel by donkey is no longer necessary, but other, less visible changes are taking place in the Dulong River Valley. This is a story about the loss of traditional livelihoods, the perils of modernization, and a hunt for semi-wild cattle — an iconic symbol of Drung culture. In Hongdang, we walk up to a wooden longhouse, new enough that sawdust is still piled up around the walls. A short girl is on the back porch washing clothes, and when she sees us, she shouts to someone inside. A short man in camouflage-print fatigues emerges from the doorway to greet us. Mr. Li Xiaozhong is a member of the indigenous Drung people and is the Communist Party chief of Hongdang village. His small yet wiry frame is the conduit through which the many layers of Chinese state bureaucracy reach this remote place. As the village’s leader, he knows everyone who lives in his village, what they do and where they go – as the village’s overseer, if something is amiss, he needs to report the trouble to his superiors in the main town. As we exchange introductions, the ground begins to rumble. A giant dump truck passes by, larger than most of the homes. 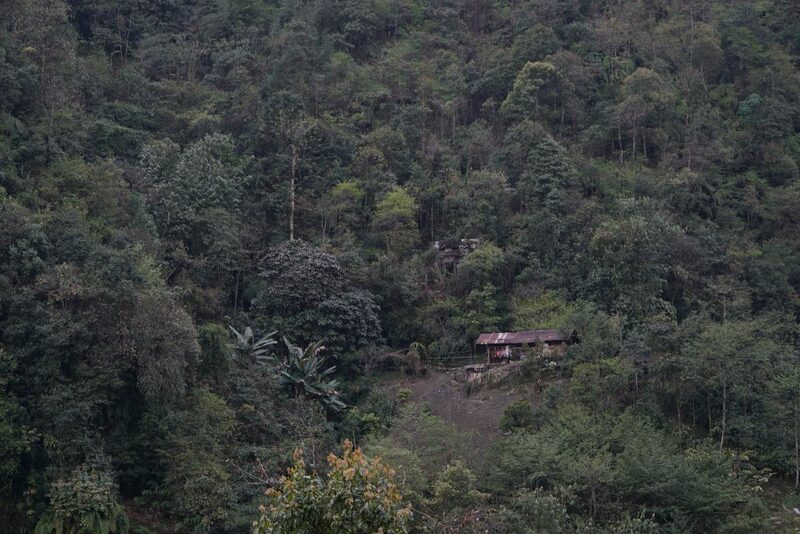 Mr. Li’s longhouse is located right on the edge of a new road that slices through the hamlet, with deep gouge marks left in the hillside by excavators. My guide tells me that only two years ago, the asphalt road we were standing on didn’t exist — even he is surprised at how fast things change. Mr. Li says little as he welcomes us into his home. I assume that as the face of the Communist Party around these parts, he has to be careful about what he reveals to visitors. The threat of reprisal looms over all government officials in China if discontent is made public, especially those out in the borderlands. Even though on the surface I look Chinese, it’s clear to him that I’m not from anywhere nearby. He doesn’t know that I have just been admitted to graduate school to study the social and environmental impacts of Chinese infrastructure development. Nor does he know that I have been working on river protection campaigns and indigenous land rights in Myanmar, just south of the border. It is better for both me and Mr. Li if I keep quiet. In China, such topics raise alarm bells. Most other Chinese tourists who come to the Dulong River Valley just want to snap photos of the elderly Drung women who bear intricate facial tattoos — a remnant of their little-understood cultural traditions. For Chinese tourists, the Drung appear as just another ethnic minority with “primitive” customs, living in “backwards” conditions. People don’t normally ask questions about who the Drung are or what their lives used to be like before government, roads, and modernity came roaring into the Valley. My guide pressed on, asking what things were like in the past. “It’s just not the same anymore,” came the reply. From anywhere in the Dulong River Valley, I could walk a few hundred feet away from a village or town and would find myself at the edge of the deep forests that blanket the mountainsides, some of which have not been altered by human hands. The Drung have always lived in this forested valley, nestled between the Gaoligong Range to the east and the Dangdalinka Range to the west. Life for the Drung out here has historically been to survive out in the rough wilderness, living off of the land by knowing the land. For generations, the Drung practiced a particular form of agriculture, called swidden, out in the marginal uplands. Although many conservationists have derided this kind of farming as a repeated sequence of “slash and burn” that destroys the forest, swidden agriculture actually helps to regenerate the soil’s fertility. The Drung farmer would start by burning a plot of forest, turning the trees and foliage to fertile ash for growing buckwheat and millet. Once he had exhausted the soil’s fertility after a year or two of farming, the farmer would move on to the next plot of land. Burn, plant, leave. This burning and moving is what gave forest-dwelling peoples a bad name. If all you saw was the burning and felling of trees, it would be easy to mistakenly see swidden agriculture as solely destructive. What many people don’t realize is that the farmer replants a forest before they leave their plot, kickstarting regrowth. Saplings would sprout among the severed stalks, eventually growing into trees. By systematically clearing land and allowing the forest and soil to regenerate, the Drung farmer’s swidden agriculture builds up the biomass and nutrients necessary for growing crops on the sloping hillsides, allowing them to return to the same plot years later. In many uplands across Southeast Asia, including the mountains of Yunnan, swidden fields are left fallow for over a decade before farmers return to them. This highly regulated, locally specific system has allowed for the sustainable management of forested lands before “sustainable management” was invented. Bureaucrats who spend their lives in cities have little understanding of such systems, and because of that ignorance, government policies have had dire consequences for the Drung people. Unlike the reticent Mr. Li, other Drung like Mr. Guo, a retired teacher, have many tales to tell about the Drung people’s livelihoods in the mountains, as well as more recent changes. These tales of life in the forest are so foreign to Mr. Guo’s grandchildren, transfixed by the TV, that they must seem like myth. “We were the best,” says Mr. Guo, wistfulness creeping into his voice, “the best hunters in this land.” His wrinkled hands deftly peel a grilled potato, handing one to me. My city-bred hands find it difficult to hold onto a potato hot off the grill, but he doesn’t seem to notice. In the old days, they used to hunt all manner of animals deep in the woods, while gathering medicinal and edible herbs in the undergrowth. Everything they used came from the forest. The Drung prided themselves on being hunters, using hand-carved crossbows to hunt deer, antelope, and wild donkeys. They would leave their homes for the woods, but not before praying to the spirits for safe passage. If they failed to pray, they could suffer. As with many other animist traditions around the world, for the Drung, Mr. Guo tells us, wan wu you ling, or “all things have souls.” The mountains are full of spirits who could alternately bring down their wrath or blessings upon the Drung — even in these days of rapid technological advancement, they respect the forces of nature, instead of trying to control it. Mr. Guo, with his rheumy eyes, looks like a gentle man. He chuckles as he recounts the times when he ran into leopards in the forest. I can imagine a sprightly, younger version of Mr. Gao, eyes close to the ground, touching the damp soil, tracing deer tracks. All he can see in front of him is a riot of greenery, vines crawling across tree limbs and forming webs in the air, leaves of all shapes and sizes stretching and struggling to reach sunlight, while the mosses are content to sit quietly on their stones. Something rustles in the bushes, sounding much too large for what he is looking for. He must ready his crossbow or his feet. But those days were a lifetime ago. Now, things are different. The first paved road to the Dulong River Valley was built in 1999, opening up the Valley to regular government access for the first time. At that point, snow would still block off the Valley for half the year. Even so, changes began to reach the Drung, under the banner of environmental protection. First, the government banned hunting to protect wildlife species, depriving the Drung communities of a key tradition and source of nutrition. Then came the directive that banned agriculture on slopes of more than 25 degrees because the government wanted to prevent soil erosion, and thus the Drung people’s swidden fields were no longer theirs. Instead of continuing traditional farming practices that were culturally significant, the villagers would receive rice subsidies, and the government would pay them in cash to plant trees on the hills that they once farmed. In 2017, the planted stands of alder trees are all the same height, making it easy to see where the fields once were. To an experienced eye, those uniform treelines are proof that the Drung used to work those lands with their hands. Even so, this mobile, land-linked lifestyle of the Drung people is not just a relic of the past. Though Mr. Li professes that he no longer follows his people’s traditional beliefs, he still knows his community’s lands and forests and rivers better than I, or any outsider, ever would. He tells us that he owns a herd of 12 Dulong cows. Though twelve cows does not sound like much, the Dulong cow is a traditional symbol of wealth and status, and the Drung people let their herds roam across the forested hillsides, semi-wild. Each cow is a walking $3,000 that is left wandering around, unattended. To keep track of these precious beasts, Mr. Li, and everyone in his family, has to be intimately aware of the landscape and its patterns. This knowledge is a characteristic that I realized can’t fully be explained by mere words. It is lived. We leave him in his longhouse, blue smoke curling from the cigarette dangling from his fingers. I can’t tell whether he’s relieved to be rid of us and my questions. He begins to boil porridge for dinner in the longhouse’s hearth, central to both home and family. The soap opera is still blaring, with the talking heads on TV looking more and more upset. Fortunately, his daughter Li Ting, eager for an excuse to avoid chores, is happy to guide us around. She is in seventh grade, older and with more responsibilities than her short stature would suggest. She takes us up the river along a road that has been blasted and carved out of the mountains, with the jade torrent of the Dulong rushing past all the while. The roaring of the icy waters fades into the background, and the sounds of the forest take over the senses. On one side of the road, unseen birds call out to each other through the green mosaic of alders and pines, in languages as diverse as the hundreds of dialects in China. Other invisible creatures are either scuttling, scampering or scurrying through bushes and over rocks. On the other side, covered with debris from the excavation work, it is quiet. The dusty road we stand on leads all the way to Tibet now, across frigid mountain passes and deserts. Li Ting says that there are a few settlements far away along that route, but she has never been there. For a country that’s known for having so many people, this is a remarkably sparse corner of China. A little trailhead appears in the bushes, leading down to the waters. The path, easy to miss, winds through the ferns and shrubs. We follow the dirt path through the underbrush to the riverside, each step sending grasshoppers flying through the bushes. The sound of rushing water gets louder and louder. Li Ting points to a hole between the gnarled roots of a moss-covered tree and tells us it was a snake’s burrow. She stretches out her skinny arms as far as she can reach to show us how big the snake was. The last time she saw the snake was “before this place was opened up,” she said. 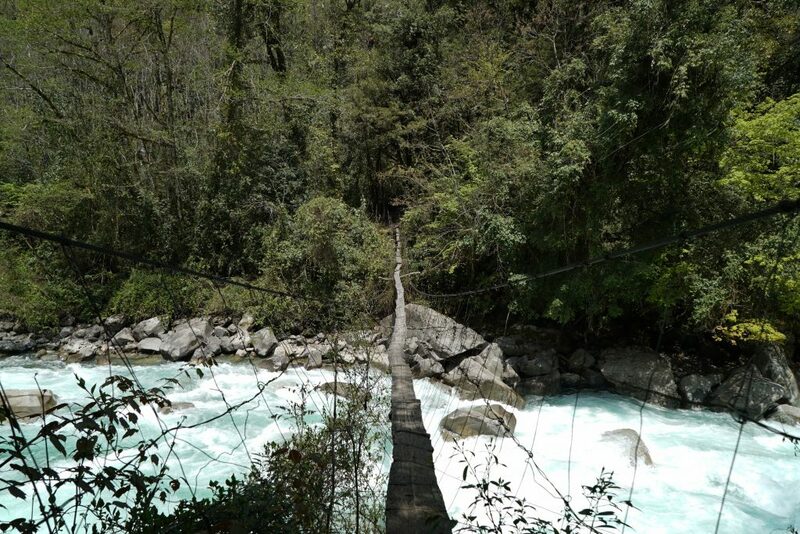 We arrive at a bridge made of cables, wire and wooden planks less than a foot wide. Impulsively, I take a few steps onto the bridge and the entire bridge creaks and groans. I imagined that since the Drung villagers used it, I could too. Seeing me, Li Ting yells, “Wait! Don’t do that!” As it turns out, they haven’t used this bridge ever since the construction crews came into town and built a new one downstream, over two years ago. A single misstep on a rotting plank and I would be food for the fish. She names plants and herbs left and right, before motioning for me to look across the river. It takes me a while before I see what she’s pointing at — a pair of large, black animals grazing on the opposite shore. There’s a mild thrill of seeing an animal one hasn’t seen before, even if the hairy creature is just a different kind of cow. The hulking beasts look like the cross between a regular cow and something more wild and rugged, like a bison. One wouldn’t expect to find such large animals in these mountains, and even more difficult to imagine these Dulong cows being your bank account. But it’s one of the few symbols the Drung have left of who they are. Despite all the recent changes in the Valley, though the Drung have lost their hunting grounds and swidden fields, the Drung still have their cows. To keep the cows, they must know the way through the forests, through the mountains. In this modern age, they still know the old ways. The Dulong’s current moves swiftly, carving its way through the valley. The water is clear and cold to the touch. 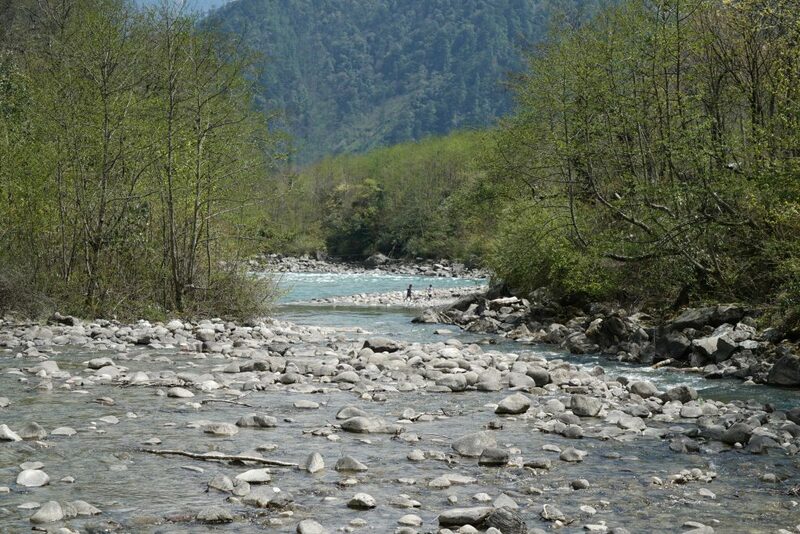 In comparison to China’s more well-known rivers like the Yangtze or the Mekong, the Dulong River is small. But its humble size belies its glacial origins in Tibet and its eventual destination. After crossing the China-Myanmar border, the Dulong feeds into the mighty Irrawaddy River, the mother river of Myanmar — yet the visual majesty of the Dulong River Valley is also the reason for the government’s drastic changes imposed upon the Drung. All around the mountainous areas of Yunnan, ethnic minority and indigenous communities like those in Hongdang are being relocated from the hills and mountains to lower elevation, some by coercion, others by incentive. In its reformulation of the American Dream into a Chinese one, the Chinese government is embarking on a mission to create what it calls a “moderately prosperous society” and an “ecological civilization” for all of the nation’s people, including the Drung. This quixotic quest involves turning the most well-preserved natural spaces in China, like the Dulong River Valley, into national parks — American style, modeled after Yellowstone — in an attempt to achieve sustainable development. While marveling at breath-taking landscapes, we often forget that the indigenous societies living around Yellowstone had to be cleared out before city-dwellers could go see “pristine” wilderness. In order to achieve this lofty goal of creating wilderness, the Chinese government has tried to relocate people from their traditional wooden homes on the mountainside to manufactured towns on the edges of newly blazed highways. After all, if eco-tourism is going to be the basis for economic development in the Dulong River Valley, the area needs more roads for people with big wallets and fewer people in nature. For the city-based government planners used to comfy chairs and air-con, the Drung communities’ wooden longhouses are “backwards” and “dirty” eyesores. A concrete home for each and every household in China would give the impression that the entire country is modern. As part of this nation-wide facelift, the government funded and built a “modern” house for Mr. Li and his family in the main town, Dizhengdang, the administrative center for surrounding villages. However, the concrete structure is miles away from his remaining small plot of farmland. If they moved to this new house, instead of having the field right outside their doorstep, he and his wife would have to walk for hours to their old home and farm, then back again. 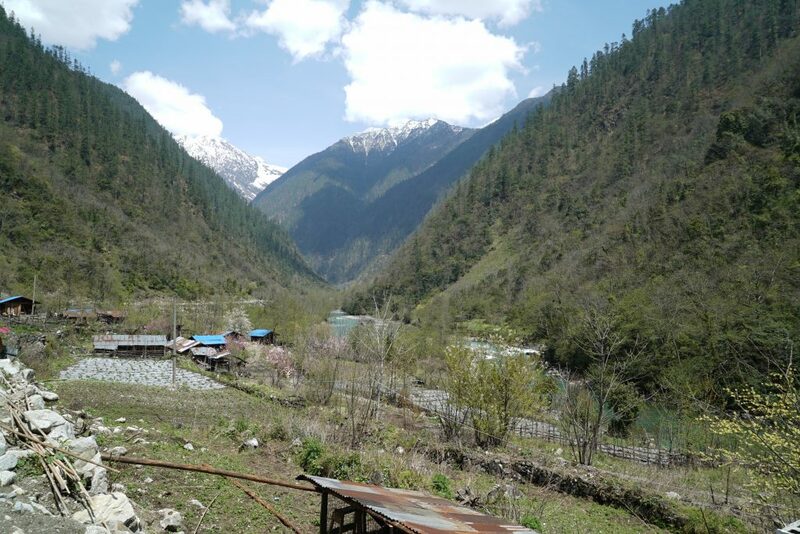 Each of the 28 Drung families in Hongdang, despite having new houses built for them in Dizhengdang, have preferred to remain “backwards.” Whether this community will eventually be forced by the state to make way for nature is unclear. He doesn’t say that the modern home is sterile, like every other newly-built, drab concrete house we have seen elsewhere throughout the Dulong River Valley. He doesn’t say that the new house is missing that crucial ingredient of Drung homes, the hearth that family and friends gather around for warmth and stories. He doesn’t say that living so far away from his herd of cattle will make protecting his wealth more difficult. All he does is continue to chop potatoes, because dinner needs to be made. Mr. Li and Mr. Guo have made it through the gauntlet of economic transition and policy restrictions relatively well off, but others have been less fortunate. Before we reached the Valley, my guide had told me about an epidemic of alcoholism and suicide throughout the Drung communities. Without their swidden fields, without their hunting grounds, many Drung are cast adrift in the modern economy. The lack of livelihood opportunities has led to Drung people leaving the Dulong Valley for work, but their lack of familiarity with China’s mega-cities and factories, along with ethnic discrimination, has sent many scurrying home. In one village, a thoroughly drunken man tells me how his brother left home for a job in a big city in southern China, but after just two or three months, he was back home in the Valley. Many Drung men have turned to the bottle to kill their time, perhaps because a man would rather be lost at home rather than lost in a completely alien city. The government’s efforts to train Drung farmers to grow cash crops and promote local markets have not been as successful as hoped, and subsidies are needed to prop up the ailing economy. These days, Drung people are almost entirely dependent on the government for income, food, and shelter. During my time in the Valley, people in different villages told me stories of neighbors drinking pesticide to end their own lives. They never explicitly explained why people reached that point of desperation, but the phenomenon alone is a testament to the deep sociocultural dislocation taking place. In China, the government moves swiftly, carving its way through traditions to fulfill its vision of “development.” Now that the Drung can’t practice the agriculture that they know, the government sends agricultural scientists to teach people how to plant new cash crops. Since the Drung can’t grow their own grains, the government delivers rice subsidies by the truckload instead. Some people would say that this is for the best. People used to go hungry, but now they have enough to eat — most of the time. Li Ting is learning English at her middle school, something that her parents would never have dreamed of. A practical man, like Mr. Li, moves with the times, out of the way of bulldozers and excavators. Yet when asked why he built a new wooden longhouse in this old village of Hongdang, away from the main town, he says, “it fits us.” A new longhouse is a small act of defiance, a compromise between who he is and those who pay him. The sun reflects off of the brilliant waters as a pair of young boys, pants rolled up to their knees, make their way across a shallow bend of the river. The petals of peach blossoms float by along the river as though nothing could be more perfect. As one of the last relatively undisturbed corners of a country wracked by contamination of its soils, waters, and air, the Dulong River Valley does seem like a hidden paradise. I can see why the government wanted to preserve the ecological integrity of this breath-taking landscape, but in this case, the costs of protecting the environment are borne by those who know it best. The road to hell in many parts of the world is paved with good intentions, but here it is also smoothed over with a healthy dose of ignorance. Life in the mountains of Yunnan wasn’t easy to begin with, but the Chinese government’s policies haven’t actually made life easier for the Drung people. Despite their deep connectedness to place and their deep-rooted belief systems and rituals, the Drung are considered to be just another one of the 56 officially recognized nationalities of China, treated as if they could be carted off to a “modern” town and be grateful. As an ethnic minority in China, the Drung are entitled to certain rights and privileges, but if their traditional ways of life in the forest do not fit into government policy, there is no room for maneuvering. In the name of progress, whether the Drung like it or not, the Chinese government will lift them out of poverty so that all nationalities can live together in “mutual prosperity.” When I hear stories of how people, strangers in their own land, take their lives out of desperation, such grim realities are hard to reconcile with the shimmering waters of the Dulong River. As our car trundles out of Hongdang, I wonder if the next time I come here, it will be smooth asphalt under the tires. It is a cruel irony to know that the beauty of this land is the very reason why the Drung’s ties to the land are being severed. By the time she is her father’s age, Li Ting will probably not be living in a wooden longhouse. It is unclear if she will stay in the Dulong River Valley, as more and more young people are leaving their villages for work in larger towns and cities. With the establishment of the national park, chances are slim that her people will ever be allowed to roam the mountains, tracking deer and antelope through the forests. Today, the mountain spirits still have their devotees, but the bonds that tether the Drung to the souls of all things may not last another generation. The Drung communities of Dulong River Valley are not alone in their dislocation. Millions in China have been uprooted from their homes and resettled in unfamiliar places to make room for large infrastructure projects, from large dams to industrial estates. Countless farms across the country have given way to endless roads. After all, this is the Chinese Dream. At the very least, the Drung will have the mountains of myth and memory. Lines can be drawn across them, people can be moved off of them, but the lives that have been lived on them will grow into legend — of a rugged paradise that was once theirs, free to roam alone. Editor’s Note: The names of individuals have been changed in this piece in order to protect their privacy. Nick is a Master of Environmental Science candidate at the Yale School of Forestry & Environmental Studies whose work is focused on the socio-environmental impacts of foreign direct investment from China in South and Southeast Asia. Nick has worked in community forestry and indigenous rights NGOs in Thailand and Burma, and his interests include the intersection of sustainable development and environmental justice in Asia. This is a well researched article. It gives a lot of information from the past to the future of indigenous forests.I like the way he considers the natives and the effect of development on their livelihoods.